Gas Can or Flame Thrower? 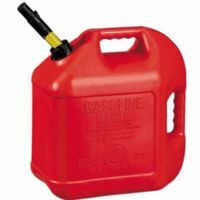 Many of us keep plastic gas cans in our garage or storage sheds. Unfortunately, most plastic gas cans are made without a safety feature known as a flame arrestor. The lack of a flame arrestor on a plastic gas can creates a dangerous condition, which could result in the gas exploding. In a widely reported case, 3 year old Landon Beadore was helping his mother pick up toys in a storage cellar when he accidently knocked over a plastic gas can like the one pictured here. Vapors from the gas can went along the floor, and the pilot light on a nearby water heater ignited the fumes. The gas fumes flashed back to the nozzle of the gas can, causing it to explode and burning Landon over 47% of his body. Landon’s shoes literally melted onto his feet. These tragic situations have come to light recently, but for a different reason than you would expect. A series of attacks have been launched by big business and tort reformers against victims’ lawyers and their clients as part of a propaganda campaign. Blitz USA, America’s largest plastic gas can manufacturer, recently announced that it is closing its factory after nearly 50 years in operation. The reason, the company claimed, is unwarranted products liability litigation. Blitz USA and other companies in the gas can manufacturing industry are blaming victims for their “ignorance” in causing or contributing to the cause of plastic gas can explosions. They cite “consumer misuse” as the main cause of these types of accidents. Rob Jakobe, another victim, disagrees. Mr. Jakobe was walking with a Blitz gas can on a crisp day in Oregon when a static electric discharge from his body caused the can to explode. Chad Funchess, another victim, was filling up his chainsaw when his Blitz gas can erupted and engulfed him in flames. William Melvin, yet another victim, was refueling his lawnmower when his Blitz gas can exploded and hurled him through his barn. –	Keep gasoline out of sight and secured away from children. – Do not let children handle gasoline. – Store gasoline in a safety can outside the home, such as in a detached garage or storage shed. – Do not use or store gasoline near potential ignition sources, such as electrical devices or any device that contains a pilot light or spark. – Never use gasoline inside the home or as a cleaning agent. – Do not use gasoline to accelerate a flame on a charcoal grill, wood stove, brush fire or campfire. – Do not smoke when handling gasoline. The attorneys at Suthers Law Firm represent clients injured and killed as a result of defective products. For more information regarding the firm and defective product cases, please see the Defective Products page at our website.